You’re not going to let a little cold keep you off the golf course. When most other golfers have put their clubs in the attic, you’re on the first tee early Saturday morning with your breath visible in the cold. If you have spent much time playing in the cold then you know that your regular golf ball does not fly as far or spin as much when the thermometer starts to drop. But with a different golf ball choice, you might be able to gain back at least some of that distance and spin. If you came here looking for a quick answer, my top overall choice for the best golf ball for cold weather is the Callaway Supersoft. If you want to learn a little more about what went into that choice or see some additional options, then keep reading. You can also CLICK HERE to check out the Best Golf Balls and our Ball Buying Guide for more options. There are a few things to know about playing golf in cold weather. You’ll lose about 2% of your distance for every 10 degree drop in temperature below the optimal 70-90 degree weather. The ball will compress less as it gets colder, so a 90 compression ball could play like a 110 or higher! Colder air is denser than warm air so there’s more drag on the ball flight as well. Once you hit freezing temps, it gets even worse than that. You can help this a little bit by keeping the ball warm in your pocket but the rules of golf don’t allow heating them artificially (so no hand warmers in the same pocket if you want to play by the rules). Most grass is either dead or dormant in the winter so depending on the moisture in the ground, it can range from really hard to mushy and soft. A cold ball will tend to fly lower with less spin, making it harder to hit greens. Leaves on the ground are really really good at hiding your ball from you, even in the middle of the fairway. Cold weather golf has its own unique set of challenges. It can be a little tricky to select a ball that covers them all, but here are the main factors I looked at when putting together this list. This is probably the most important factor to consider when choosing a golf ball to use in cold weather. As the temperature gets colder, the core of a golf ball will become harder. Do You Need A Soft Cover? The ground usually gets harder in the winter. The grass, even on the greens, is dormant, so there is less for the ball to grab onto when it is spinning and hits the green. Even with the softest urethane covers, there’s really no way around the fact that you’re not going to get as much ball stopping spin as you do in warmer weather. So that means you really want to make sure you have a ball with a soft cover. Usually this means that you want a ball with a urethane cover. Unfortunately, that also means a more expensive golf ball (which isn’t that desirable in the winter…see next section). This is an area where you will have to decide on a compromise between cost and performance. BUT, when the ground is wet, it doesn’t dry as fast when the weather is cold. So you may end up with a soggy course that results in plugged balls on the fairway and green. In that case, you may not be all that concerned with cover softness. So this is really a game time decision. Depending on the region you play in, you may get more dry than wet days or vice versa, but you may end up having to figure it out when you get there. It can be helpful to have two type of winter balls ready to go. One with a urethane cover for the dry days and another less expensive model for the wet days. If you play frequently in the colder weather then you know that it is a lot easier to lose a golf ball in the off season. There are a lot of reasons for this, including leaves on the ground, harder ground, and more standing water to name a few. This is the main reason why cost should be a factor when choosing a winter ball. Of course this is your personal preference depending on your own budget. 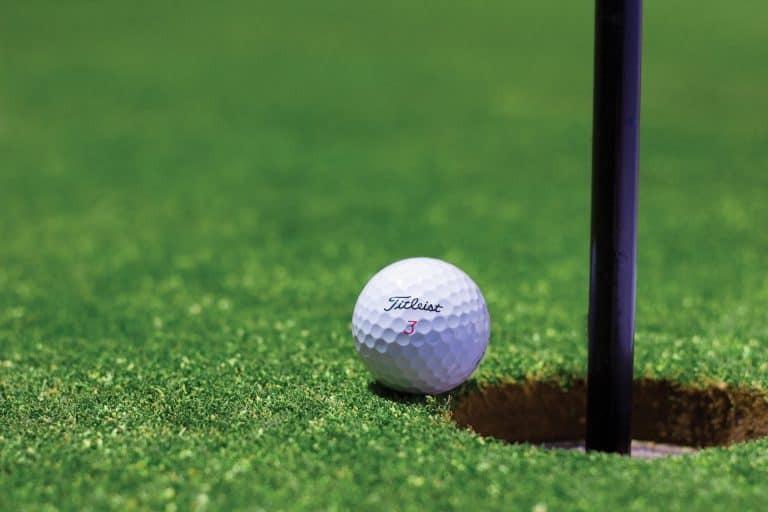 Another reason you may want a less expensive golf ball for the winter is that your scores may not count towards your handicap anyway (depending on where you live). Again, this is a personal preference thing but if the scores don’t count towards your handicap then you may want to save a few bucks when you play your winter rounds. Here’s the rundown of my top picks for playing in cold weather, broken down a little more for specific needs. The Callaway Supersoft was practically made for winter golf. With a compression rating of 38, you’ll be able to get good compression and reasonable distance with this ball even in the coldest temperatures. You can’t argue with that 38 compression rating, but there is more to this ball then just living up to its name. It might be the best cover you can get at this lower price point. Callaway claims that their cover is better than the average inonomer cover. After trying it out, I’ll say that it is somewhere between the usual ionomer cover and the more expensive urethane covers. So for most golfers playing in the cold weather, this is a great compromise between price and performance. It’s also a pretty good option for any skill level when the greens are wet and soggy. 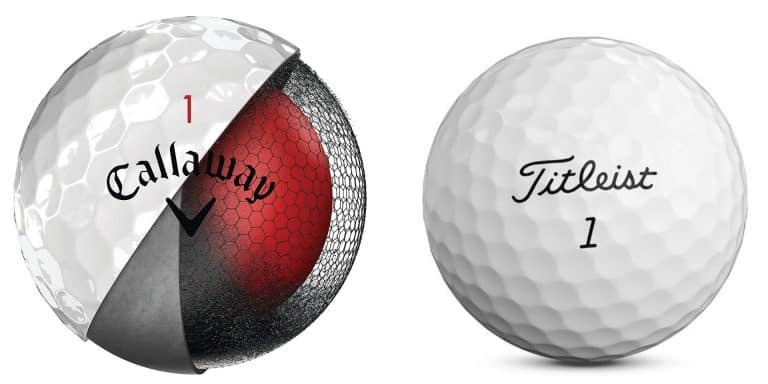 I try not to recommend the Titliest ProV1 for too many categories on this site because it’s probably the first ball everyone thinks of and I want to offer you some variety. But if you are a low handicapper with a decent swing speed then this might be exactly what you need for playing in the cold. You’ll rarely go wrong with a Pro V1 if you have the game to make it work for you. This ball has a compression rating of 90, which is on the lower end for premium tour golf balls, but still the highest compression rating on this list. Since we are talking about playing in cold weather, keep in mind that this ball will probably play more like a 100 or 105 compression ball once the temps drop. So this option is best for those of you that usually play a ProV1x or other ball with a compression of 100+. The biggest benefit of the ProV1 in cold weather is going to be the soft feel around the greens. This ball, like other premium balls, has a urethane cover. So it will play very soft around the greens. If the conditions are wet, then you may have to adjust a little, but the soft cover will give you a lot more control in most situations. Overall, the ProV1 is a better player’s ball. So for those of you that play at that level, this is a great option in the cold weather. The Srixon Soft Feel is kind of a sleeper pick for this list. I had never used one until I tried it out when making this list. For the price point, it is a pretty good golf ball and great in the cold. The Soft Feel is in its 6th generation. This ball is targeted at the slower swing speed players with a 60 compression which makes it perfect for most players during cold weather. The latest version was also designed with a softer cover for more control around the greens. It’s not the urethane cover of the ProV1, but it’s not bad. This “softer” ionomer cover also gives the ball a softer feel (I guess that’s where they got the name) on longer shots. This is especially nice when you hit one a little thin in the cold. It doesn’t hurt your fingers as much. As an added bonus, there is a Lady model that comes in pick…which makes it really easy to find in a snow bank. Looking For More Golf Ball Recommendations?